Parts of south London were hit by flash floods following a massive storm that swept across the South East. 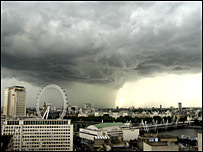 The storm broke out at about 1700 BST on Tuesday and lasted about 20 minutes. Eyewitnesses reported seeing the sky suddenly turn dark before the torrential downpour of rain and hailstones began. Emergency services were indundated with calls after several areas including South Wimbledon, Putney, Clapham and Brixton were hit. The weather caused travel chaos and delays for commuters as roads in south London struggled with the heavy rain.